Directed Vapor Technologies uses the unique properties of Directed Vapor Deposition (DVD) which is an advanced version of physical vapor deposition (PVD) to create newly possible coatings solutions, thus enabling our customers to extend the potential of their core technologies. The DVD technology has the capability to deposit thin and thick films, using controlled compositions and architectures, at a high rate onto complex components. The result is a low cost processing approach for creating engineered surface coatings that are often difficult or impractical to produce with conventional techniques. Directed vapor deposition marks a fundamental breakthrough in the way manufacturers apply high-performance coatings. Significantly more efficient than traditional coating technologies, DVD frees manufacturers to coat complex shapes with metals, alloys, and ceramics, with or without a clear line of sight. Coatings can be applied faster than with older methods, with a greater variety of materials, and with a much higher degree of control. DVD cuts the costs of the coating process, ensures high coating performance, and expands coating options. DVTI is dedicated to meeting your coating needs through the development of advanced coating solutions and the design and manufacture of novel coating deposition systems. 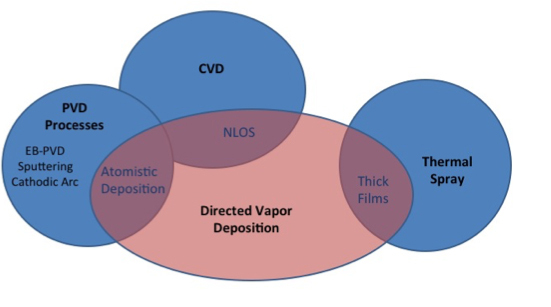 Directed Vapor Deposition (DVD) is capable of meeting highly demanding requirements for coating composition and morphology, while reducing overall costs. Non Line of Sight Deposition: A unique feature of DVD no traditional technology can offer. Unlike other vacuum deposition technologies, the high pressure gas jet carries vapor atoms into internal regions of components and then scatters them onto the internal surfaces, resulting in NLOS deposition with similar properties as the line-of-sight areas. Multiple Source Evaporation: Another unique feature, no other methods permit as many evaporation sources. This allows the creation of alloys with precise compositional control as well as permitting complex, multi-layered coatings to be deposited in a single step. High Deposition Rate: Vapor phase collisions between the gas jet and vapor atoms allow the flux to be “directed” onto a substrate which equates to precise control at very high deposition rates (> 10 μm min-1). Minimal Waste: DVD has a very high Materials Utilization Efficiency, meaning it applies most of the evaporated material onto the desired substrate and not onto the chamber walls, a problem with previous technologies. Plasma Activation: DVTI has added further versatility by incorporating hollow cathode plasma activation. This capability can be used to improve the density of DVD layers as required. “Soft” Vacuum Chamber: Unlike earlier technologies, DVD requires only a “soft” vacuum, allowing for chamber pump-down times of a few minutes rather than the few hours needed for conventional techniques. This translates directly into increased production rates. Lower Cost: Faster production rates, less wasted material, and increased life span of advanced coatings reduce coating costs to our customers.